canyon roads with briefer stretches of wide-open four-lane highway driving. Our test unit was equipped with most of the available amenities, including the navigation package and the Remote Touch controller. The HS 250h is set up to ride and drive like a compact family car. built for ride quality rather than extreme speeds and road-holding. and textures that might come through to the cabin in a sportier car. City/Highway, with combined city/highway fuel economy rated at 35 mpg. feels subtly, but noticeably, different from the Normal mode. full-throttle acceleration is enhanced a bit by faster fuel delivery. or for use in areas where only electric cars are permitted. could operate the brakes to work either way. of the stack where it can be seen at a glance. noise is very low at speeds below 80 mph. 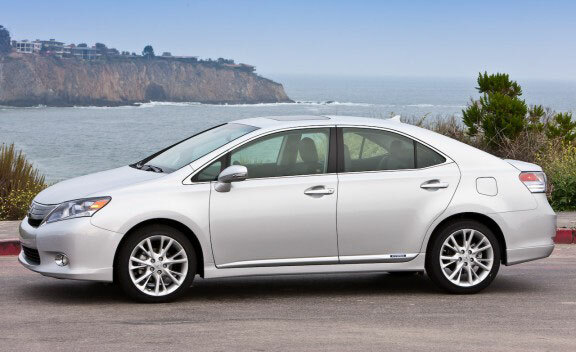 How come lexus doesn't put auto fold mirrior anymore?